Disclosure: This post is in collaboration with Gourmet Garden US. As usual all opinions are my own. Thank you for supporting the brands that support NJB! The weekend is here and gone but I am super grateful for the relaxing weekend we had! While it was a short week last week, it did not feel that way at all. The weekend before last we were out of town for the Dave Mathews Concert at The Gorge, and we stayed in Leavenworth, Wa which is a cute Bavarian town an hour away from the shows. I’ve always wanted to stay in Leavenworth, and we were able to find the cutest ski cabin on Air BnB that fit us perfectly. The charm of that place was off the charts, I would totally stay there again. The owner, while we never met, was super sweet and had a good vibe, which is mainly what I look for in a place. We had the best time driving around parts of Washington I have never visited, and the shows were just perfect. I loved every second of our adventure. We looked for sage for cleansing the house, rock shopping in Ellensburg, peach buying in Yakima, wine tasting in the Gorge on the Columbia, and nacho eating in White Salmon, Wa. So incredible, full of surprises, and simply fun. We all need fun in our lives, and it is so nice that we all get along so well that we can enjoy a weekend like that together. Then we come home to a week full of good things, work to be done, lawns to be mowed, peach jam to be made because we bought seventy five pounds of peaches, and one pan meals that help with my sanity. Which also includes the weekend of relaxing before going to Seattle this week. Brian is staying home with the kitties and I am off to the blogging conference. 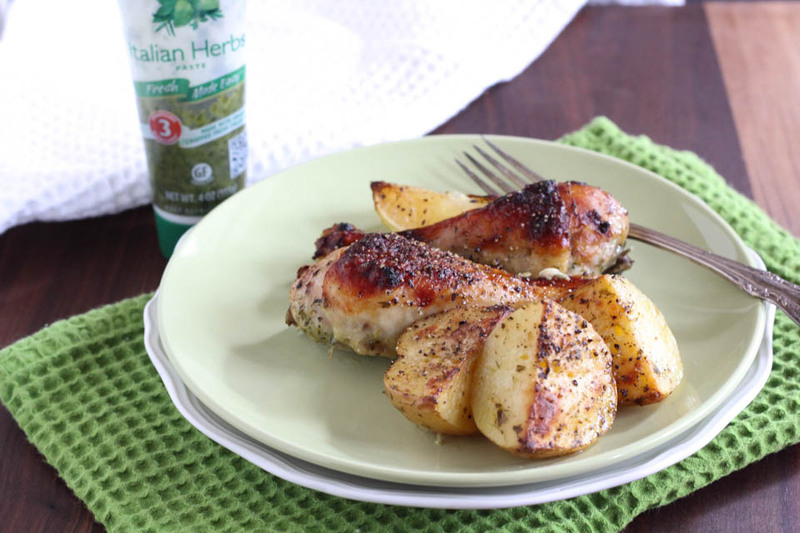 So Roasted Herb Chicken and Potatoes is a go to around here for times like these. It’s a one pan meal easy to make all week long. I do make a separate vegetable, because roasting man vegetables for 50 minutes would be way too long! Plus it literally change from ninety degree weather to blanket, roasting dishes, cozy sweater weather, perfect for this dish! I am so excited to see my blogging friends at IFBC this weekend in Seattle! If you’re going lets connect! Place oven rack in top third of oven and preheat to 400 degrees. 1. Place olive oil and herb in a shallow large oven safe pan/pyrex, stir to combine. Place chicken, potatoes, onion, and lemon in pan, combine well with olive oil mixture. Allow to sit for 15 minutes on counter while oven preheats. 2. Sprinkle chicken and potatoes evenly with salt and pepper. Place in oven to roast for 50 minutes, or until internal temperature reaches 160 degrees. Remove and serve immediately. Place leftovers in an airtight container for up to 3 days. Absolutely love this kind of meal for an easy, comforting fall dinner! 75 pounds of peaches, luv! Have fun at IFBC!! I attended the first one years ago and every year wish I could go back. 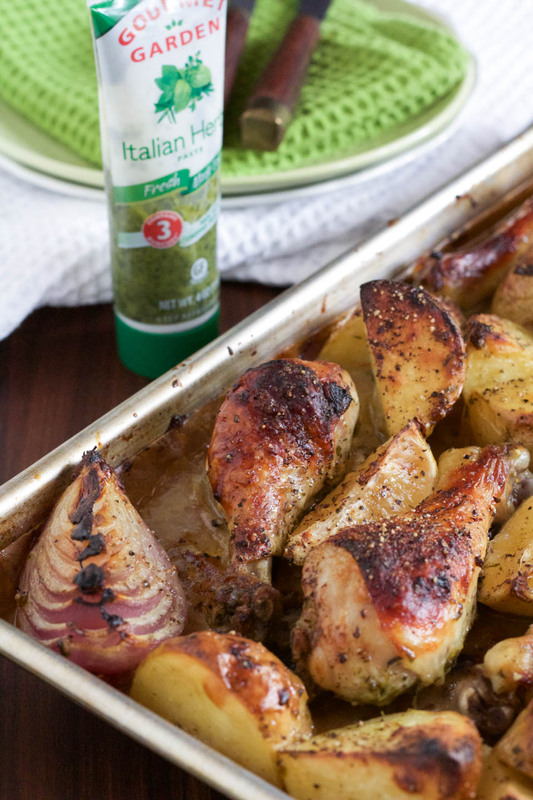 😉 Like how you’ve used GG Italian herbs on this classic dish of chicken & potatoes, Fabiola. Beautifully and deliciously done! Hahaha 75lbs was a bit nuts! Thank you so much, I had a great time. Just a lovely, classic Sunday dinner! Perfect! I love a good one-pan meal. This chicken looks amazing! Anything with fresh herbs brings food to a whole new level. This is a great dinner that we could eat for an entire week! It was so awesome for lunch leftovers! Roast chicken is my favorite fall meal and this looks so yummy with the herbs! So delicious! And roasted is my favorite way to eat potatoes! Love a good one pan meal! 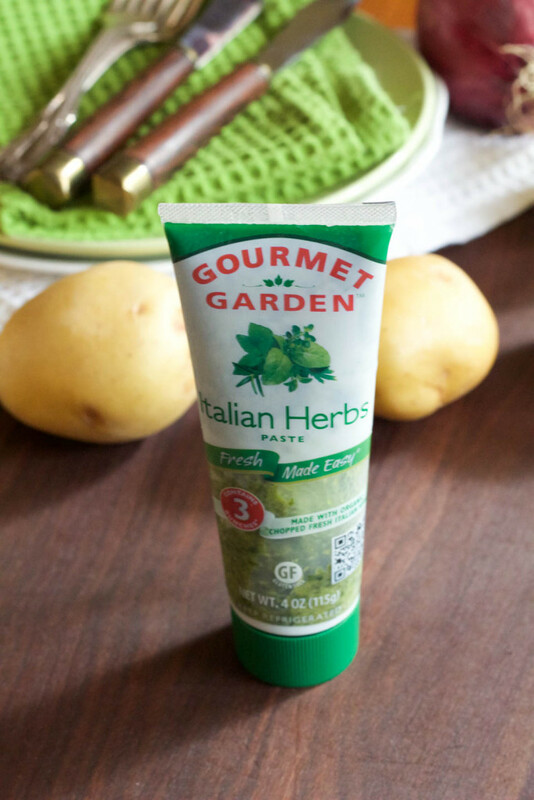 Oooh Italian herb paste sounds awesome! Wish we got them in the UK! 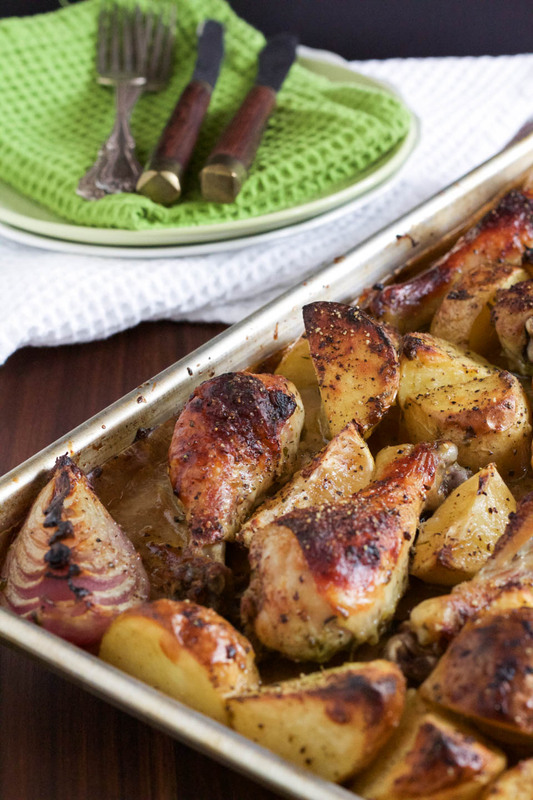 I love a good roast of chicken & potatoes and this looks fantastic! This is exactly what I’m in the mood to eat in fall! So hearty and classic. A perfect Sunday Supper meal!